About 30 kms from Aurangabad is yet another sickle-shaped hill Ellora. The rock-cut temples - 34 in all- belong to three faiths: Buddhist, Jain and Hindu. These were built between A.D. 4th and 13th centuries. While the Buddhist temples are simple in style, the Hindu temples present quite sophisticated execution. "I may err in my judgment, but it is my humble opinion that no monuments or antiquity in the known world are comparable to the caves of Ellora, whether we consider their unknown origin, their stupendous size, the beauty of their architectural ornaments, or the vast number of statues and emblems, all hewn and fashioned out of solid rock! In publishing this work, therefore, so, far from imposing upon the public, I hope and trust that I am rendering a service to the antiquity, and contributing to the amusement and instruction of the general reader”, wrote apologetically John B. Seely, Captain of the native infantry, in his Wonders of Ellora, in 1824. World-famous today, only in 1819 the Caves of Ajanta and Ellora were discovered. It happened almost accidentally when an English officer went for hunting into the forest near Aurangabad. From the scrape of crescent-shaped hill, he noticed a strange glitter in the foliage. He set out to explore, enrolling assistants from the locality. By and by a wonderful world, 2 000 years old, emerged, as caves were opened up. Whoever was behind the creation of the amazing art of Ajanta and Ellora, his vision was sublime and he had secured a group of extraordinarily gifted artists to execute his vision. So within this secluded valley they set to work to excavate in the precipitous escarpments of the living rock places of worship and of residence, pillared halls and cell-surrounded courts adorned with beautifully carved sculpture, and marvelously executed painting. Wonderful in their architectural planning and engineering skill; these eternal structures which serve the interests of an eternal quest do not stand astride the horizon obscuring the sun and sky, but are veiled deeply by the massive folds of mountain rocks, and luxuriant verdure. The monsoon is not only rainy season in this area, but also the flowering season of many plants that can be experienced in their full splendor. The caves were carved into the volcanic basalt. The weathering has also led peaks to be to flat. In Ellora, one can also see the channels through which once lava flowed (near the cave 32). These channels have a characteristic brown color due to the overheating. Similar rocks were also used in the construction of the nearby Grishneshwar Temple. They were also used for the flooring of the Bibi-ka-Maqbara. The cave temples of Ellora can be categorized into three broad categories. These are Buddhist Cave Temples, Hindu Cave Temples & Jain Cave Temples. Buddhist Caves:The sculptures in these Buddhist caves convey the nobility, grace and serenity that Buddha possessed. Caves 6 and 10 contain images from the Buddhist and Hindu religion under one roof. The Vishvakarma cave is both a Chaitya and a Vihara with a sitting Buddha in the stupa. Its two-storey architecture supports a colorful pageant of dwarfs who play dance and musical instruments. This work is carved from solid rock and represents a sanctuary of the Buddhist monks. Kailasa Temple: Constructed by the Rashtrakuta king, Krishna I, this is a marvel in architecture, approximately twice the area of the Parthenon and greater in height, lavishly carved and sculptured with epic motifs. This fabulous edifice is hand-carved from a single rock and has a gateway, pavilion, courtyard, assembly hall, vestibule, sanctum and tower. The Kailasha Temple has no parallel in the world. The Kailasa Temple in Cave 16 is a masterpiece in itself. The whole structure was carved from a single boulder by hand and took more than a century to complete. 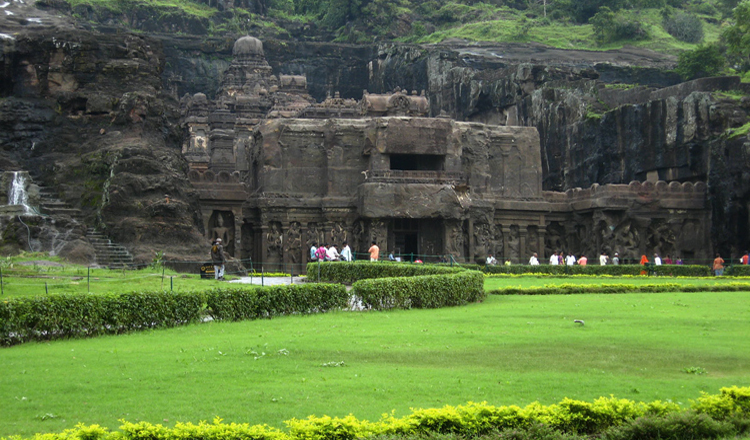 Kailasa Temple, representing Lord Shiva’s eternal abode Mount Kailash is the world's largest monolithic structure. In contrast to other temples, which are usually built from the bottom upwards, this temple was constructed by chiseling the mountain from the top and the side. It is 50 meters long, 33 meters wide and 30 meters high. The temple is a representation of Kailash, Lord Shiva's home in the mountains. The temple is decorated with carvings, sculptures, themes and events from the Puranas, Mahabharata, Ramayana and the adventures of Krishna. The temple is closed on Tuesdays. Hindu Caves: Cave 15 is the finest Hindu cave in Ellora. It has the "The Avatar" (ten incarnations of the god Vishnu) and the fascinating scene, in which Nataraja and Shiva rise from a Lingam. The Ramesvara cave has numerous river goddesses at its entrance. The Dumar Lena cave resembles the great cave shrine in Elephanta and is dedicated to the god Shiva. Jain Caves: Cave 32 is a prominent Jain Cave. It is a beautiful shrine with exquisite carvings of a blossomed lotus on the roof and an imposing Yakshi under a fruit laden mango tree. The ceilings of this double-storey cave are decorated with paintings. While caves 32 and 34 contain large statues of Parasvanath, other caves show images of the Jain Trithankara. One of them also has a sitting figure of Mahavira. How to get to Ellora? By plane: The Aurangabad airport is close to the caves of Ellora (15km away). From this airport you can reach Delhi and Mumbai and vice versa. By train: The closest train station is in Aurangabad. It is reached by the "South Central Railway Line" and it is merely 30 km away from Ellora. By car: Aurangabad is close to the Ellora Caves and is well connected to many roads. From Aurangabad, buses and taxis can travel to Mumbai, Pune, Ahmednagar, Jalgaon, Shirdi, Nasik, Dhule, Ahmedabad etc.